What Will Bioengineered Plants Be Like In The Future? As we head deeper into the GMO era, it's fair to wonder just how far we can manipulate the biology of plants. Here are a few possibilities — from spore-spewing super-plants to delicious hamburgatoes. An exponential change perspective, well-known among futures enthusiasts, was applied to time itself by Freeman Dyson in 1997. He taxonomized the future in terms of different, order of magnitude generations — time horizons of 10 years, 100, 1,000, and so on. My book The Human Race to the Future: What Could Happen and What to Do follows Dyson's lead by organizing visions of the future roughly in these generations. But the topic of genetic change is a tough one to place. Perhaps change of a degree that would take hundreds of millions of years to occur naturally could be matched by genetic engineering in a vastly shorter time. Imagine if we understood the mechanisms of biological systems well enough to be able to engineer whatever is biologically possible. With understanding currently expanding fast, this might come into view within our lifetimes or those of the next generation. That would bring on a new era, a flavor of technological Singularity characterized by amazing biological processes that are limited only by intrinsic limitations of physics and chemistry. In this approaching era, what might be biologically possible for plants? Here are a few possibilities. No biological principle exists forbidding the same plant from reproducing by both spores and seeds, thereby enjoying both the ability of dust-like spores to disperse in enormous numbers and the ability of the much larger seeds to provide nutrition to baby plants to give them a robust start. In fact, "under the hood," seed production already involves spores as an intermediate stage. Consider oak trees, for example, which normally produce acorns. But instead of dropping its leaves to rot away, millions of cells in the leaves could transform into millions of microscopic endospores, similarly to what anthrax bacteria do. Blowing in the wind, each spore particle in this multitude will eventually land and potentially start a new plant, a clone of the old one. Such plants would continue to produce seeds as they always have, to continue having genetically varied (non-clonal) offspring. But rather than just dropping their leaves in the autumn to rot on the ground they will more efficiently use them as an opportunity to reproduce, by transforming their leaves into a dust storm of spores. If by natural accident or intentional engineering, some plant becomes the first to do this, things may never be the same again. Such plants might out-compete other plants, perhaps coming to dominate the plant world just as flowering plants now dominate after first evolving over 140 million years ago. Let us ensure that only beneficial plants become such superplants, else superweeds may overrun the Earth. Beans contain lots of protein, which makes them nutritious. One of the major chemical building blocks of protein is the element nitrogen, but bioavailable nitrogen is often in short supply, limiting the production of protein and thus the life-supporting capacity of the biosphere. Beans, however, have a clever workaround strategy called nitrogen fixation: the ability of many legumes — including beans — and a few other types of plants to "fix" nitrogen directly from a virtually unlimited source: the air. If fixing nitrogen takes sufficient hold in the plant kingdom, nitrogen need never be a bottleneck to growth again. The Earth will be able to support a thicker, heavier, more diverse blanket of vegetation. Since the animal kingdom ultimately depends on plants, the Earth will also then support more animal life and, potentially, human life. Artificial production of nitrogen-containing fertilizer was a key part of the agricultural green revolution of the 20th century, making it possible to feed that century's huge expansion in human population. A next step is to engineer food crops to fix nitrogen, eliminating the need for nitrogen fertilizer. A project announced in 2012 to do just that for food plants like wheat, corn, and rice could, in the future, help farmers worldwide. Nitrogen fixers, better able than other plants to obtain an essential nutrient, might just take over the world similarly to how flowering plants became ascendant starting more than 100 million years ago. 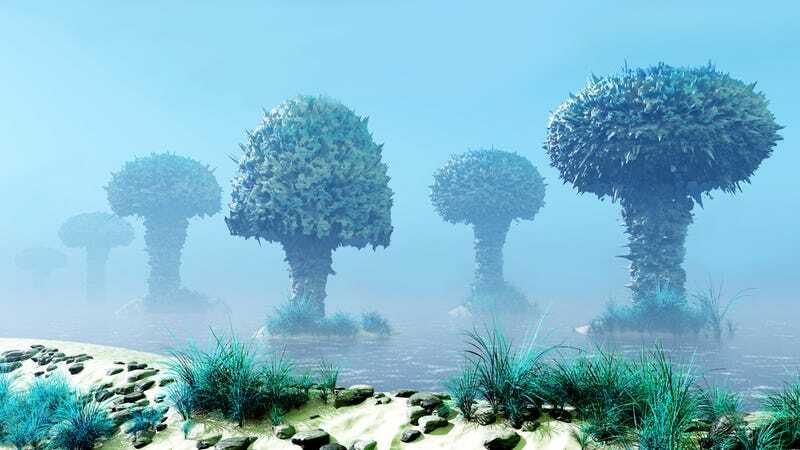 If they also adopt the spore storm paradigm, that will make the Earth's plantosphere vigorous indeed. Beans don't taste as good as meat to many people. Yet there is no reason they can't be engineered to taste like small chicken nuggets. Processed fungus protein called mycoprotein, sold in grocery stores, tastes like chicken already. But why stop there? Potatoes with small hamburgers in the middle sounds good — let's call them "hamburgatoes." There is no reason hamburgatoes can't be grown once genetic engineering gets further along. Carrots are crunchy, as are potato chips. So why not grow carrots that taste like potato chips, but retain the nutritional advantages of traditional carrots? Kids would want to eat more veggies. Sunflower seeds come in packages at many supermarkets, but the ones with the seeds still in their shells seem less popular as snacks because they are harder to eat. You have to bite off the shells to get to the rather small seed inside. Yet the sunflower seed market would almost certainly grow dramatically if the seeds were ten times larger or more. Imagine eating an enormous sunflower seed the size of a small egg … hefting its weight in the palm of your hand … cracking off its shell to reveal the rich, tasty meat within … and finally sinking your teeth in to savor its nutritious and distinctive flavor. A future sunflower could produce just a few seeds like that, instead of dozens and dozens of smaller seeds like the sunflowers they used to grow back around 2020. Fruit is healthy and has near-universal appeal. Even people who have never eaten fruit in their lives rapidly develop a taste for it. Who are these people, you might ask? Babies. As 20th century baby and child care icon Dr. Spock put it, "Babies are puzzled by fruit …. But within a day or two practically all decide they love it." We think about the theoretical limits of what is biologically possible too infrequently. There is plenty of excitement around the corner in genetic engineering, yet the limits are far beyond that and even more exciting. The creation of life at the limits is an engineering field that is barely in its infancy, but with a future likely to be more strange and dramatic than most dare dream. This article originally appeared at KurzweilAI and is reprinted with permission.